The magic is in the ShakeSphere capsule design.  Find your perfect ShakeSphere shaker bottle from our range of colours and logo styles.  We release new bottles regularly, so check back for new colours and styles. The magic is in the capsule design. 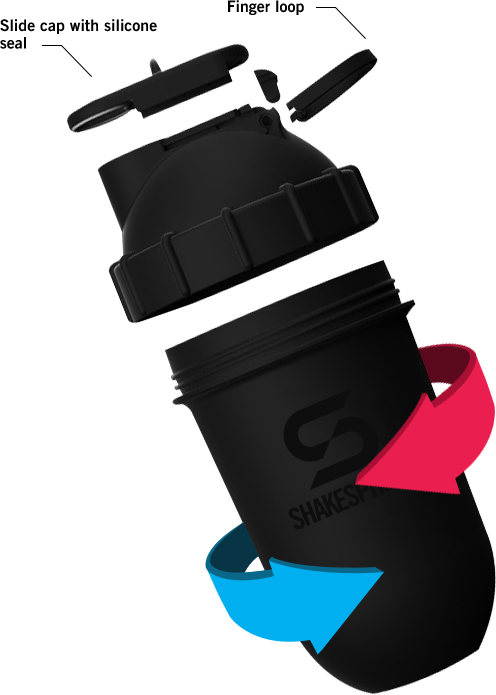 The unique patented shape of all ShakeSphere shakers means that your protein powder will not get stuck in any awkward corners; which means less wastage, easy peasy cleaning and no nasty shaker smells. And what’s more, less wastage means more money in your pocket! When compared to other protein shakes on the market, we’ve found that our uniquely designed shaker can save you on average 3g of wasted protein per shake. In a full tub of protein, this saving can amount to over £2 of powder per container. Your new protein shaker will soon have paid for itself in reduced wastage alone. There’s also no funny business with how the product works. All you need to do is place your ingredients into the shaker, twist the lid shut, make sure the cap is closed, and shake!  In less than 15 seconds, you can have a perfectly mixed proteins shake. We’ve been out there and tested in the real world variety of different shaker bottles. From freebies to premium motorised bottles, every alternative we’ve tried seems to have one or more pitfalls to their design. Our products have been designed by world champion athlete Rick Beardsell. As an athlete, Rick had been using shaker bottles for years, and he couldn’t get over how poorly they worked. Many a time Rick had been caught with protein clumping in the corner of his bottle, or shaker bottles were bursting open in his gym bag - yuck. 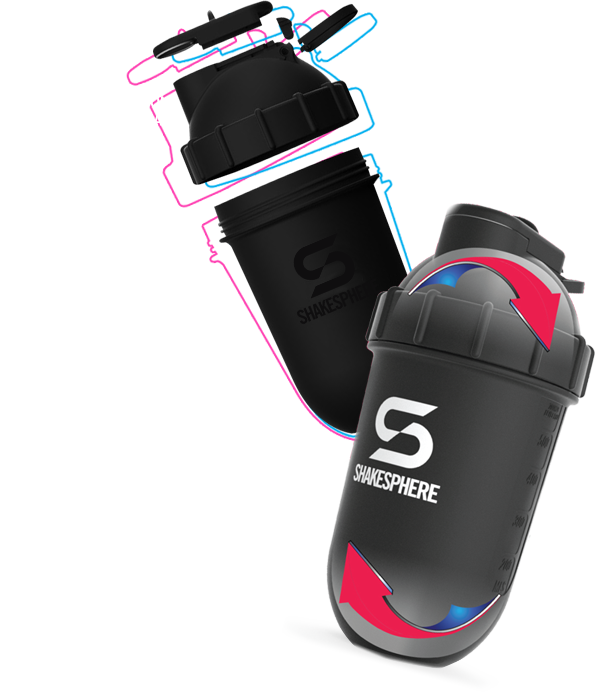 The patented ShakeSphere design has a round base and round lid which creates a capsule shape. The unique bottle shape creates a mixing environment which quickly breaks down any form of mixing powder or soft fruit. Yes! Our shakers even break down soft fruit without blades or electricity. Just place any soft fruit into the bottle, shake for 30 seconds, and be wowed as your fruit becomes a soft blended paste. This paste can be used as a base for any smoothie or protein-based drink. A round base is vital to stop the mixture from getting stuck in the bottom of the shaker bottle. This is a feature which no other shaker on the market has. Due to the square edges of other bottles, there is an increased risk of protein getting caught around the angled edges which stops the powder from being mixed. Our capsule design breaks down protein powders by shaking. The mixture passes around the hemisphere base and lid to create a centrifugal force which pushes the contents of the shaker around while inertia breaks down the powdered mix. 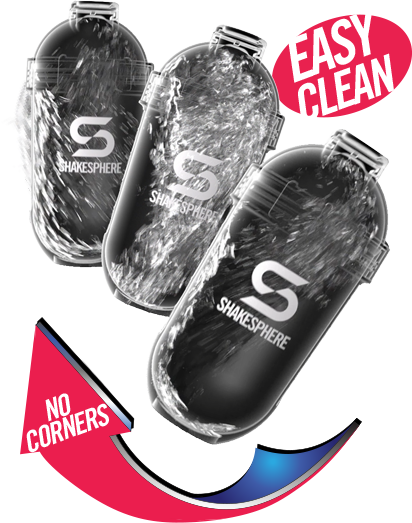 Here are some of the main features and benefits of our ShakeSphere bottles, from the way they should be cleaned, to the technical advancements we've made. Have you ever popped open your old protein shaker and noticed loads of remaining protein mixture at the bottom of the bottle? Yes, we’ve all been there, and it’s not nice. The unique spherical design of our protein shakers means absolutely zero protein mixture gets stuck. What this means is that you get a smoother protein shake which saves you money. After all, every gram of protein powder wasted is money out of your pocket. Research has shown that BPA can be harmful and toxic to your body. Some plastics are made with BPA, and you may find other shaker bottles on the market which have this nasty chemical in the plastic. All ShakeSphere bottles are BPA free, which means you potentially be placing harmful chemicals into your body. 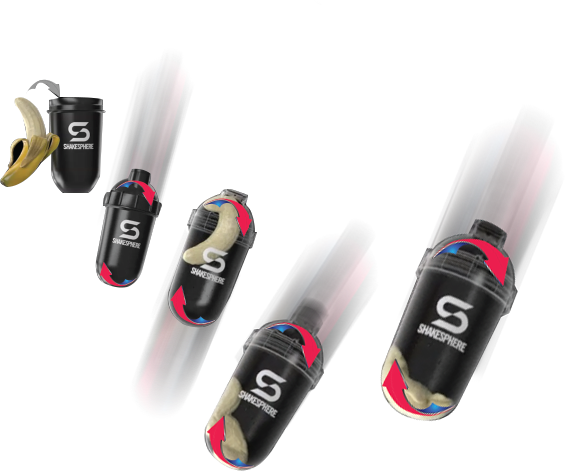 Almost every protein shaker owner will have experienced a bottle leaking in their gym bag once or twice. In most circumstances, the main reason for this is due to ineffective lids. Flip cap lids, twist lids, slides, they all seem to leak after regular use. Our shaker comes with a nifty sliding lid with a silicone seal. The silicone seal and lock creates a watertight environment which means no leakages are possible. That’s right, no more unwanted leaks. The ShakeSphere blending process means almost all soft fruit can be broken into a paste which is ready for your other favourite smoothie ingredients. Yes, that morning banana smoothie you love can be made up without the need of a free-standing bladed machine. Whatsmore, with most machine blenders, your soft fruit is blended so much that the fibre content within the fruit is broken down, making it less useful and beneficial to the body. The blending process in our shakers means the fibre in your soft fruit is maintained, so you get the same great taste with the full nutritional value you’re expecting to get. Our shakers are 100% freezer safe. This means you can throw your shaker in the freezer without worry of it breaking under the extreme freezing conditions. Here’s a top tip - You can make delicious protein ice cream using our shaker by combining yoghurt, milk and protein powder and placing it in the freezer. Take the shaker out every hour and give it a shake before putting it back in the freezer. Delicious protein ice cream can be yours in around 4 hours, yum. The centrifugal force of the liquid swirling around the protein capsule causes powders to be broken down with ease. That’s right, our shaker eliminates all those annoying lumps and bumps you often find when mixing your favourite protein mixture. We’ve run the numbers, and our shakers leave little to no residual waste after you’ve mixed your protein shake. Apart from the odd droplet, your ShakeSphere shaker will not only save you on washing up but also save you on wasted powder and ingredients. All you need to do to clean your shaker bottle is simple to place some warm soapy water in the shaker and shake! However, if you just need to rinse the bottle after a quick shake at the gym, some cold tap water will do the job just fine. It may look small, but our ShakeSphere Tumbler has a capacity of 700mls and can blend soft fruits and powders in no more than 10-15 seconds; that’s some serious speed.  We’ve compared our tumbler to all other shaker types on the market and run the numbers to see how much our bottle can save you in wastage alone. Check out the table below to see how your current protein bottle shapes up against the ShakeSphere Tumbler. ShakesSphere was presented to me at Fibo Germany. I bought the V2 there and tried it out at home. It works fine with dairy-free protein too (rice protein). No clumps or anything. I also like the pill cases and the storage part at the bottom. The best thing about it is the absence of a mesh or ball. The shaker works perfectly fine without it because of the shape. There is no waste after drinking and it's easy and fast to clean. The product definitely deserves to be well-known in the fitness industry. As a regular user of protein shakes over several years, I've got through my fair share of shaker bottles & decided to give this Shakesphere bottle a try. The powder & pill compartments are a clever idea, ideal for prep, I use to have to put my protein in a sandwich bag & it was really messy, this is so much easier. What really sets this shaker above any other I've used though is how well it mixes, I was a little concerned at first with there being no spring ball or grill to stop lumps but the bottle mixes powder brilliantly. I found there was no powder stuck in corners after mixing, because of the rounded base, meaning no waste. Fast delivery to top it off, can't fault it. 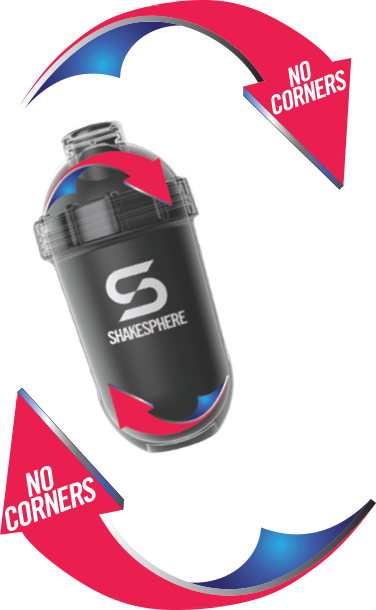 The ShakeSphere is the last bottle you'll need to buy. It is one of those marginal gains that once you have it you'll not be able to live without it. 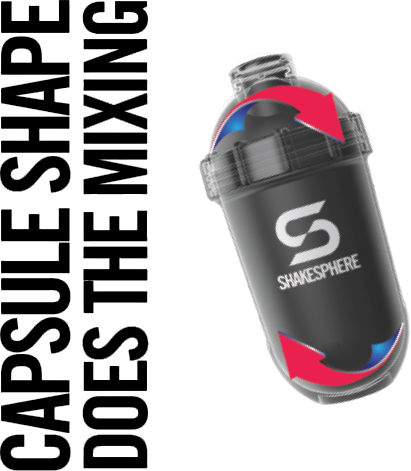 The ShakeSphere takes the tedium out of making sports drinks.